There is nothing worse than opening a jar of homemade pickles, biting into one, and finding that they are all soggy and nasty. Blech! OK, nothing worse might be slight hyperbole, but you know what I mean. Many MFPs I know don’t even like making homemade pickles because they get so soft. But alas, I am here to help! Here are my top ten tips for keeping pickles firm and crispy – from the least, to most useful (in my humble opinion – I did reorder quite a few times). This is the publication where I got some of this info – here. 10. Always use cucumber varieties meant for pickling – a pickling cucumber and cucumber for your salad were bred for different purposes. 9. Don’t bother with alum. OK this one is more of a tip of what not to do, but some recipes you will see, especially online or in older pubs, still call for alum. 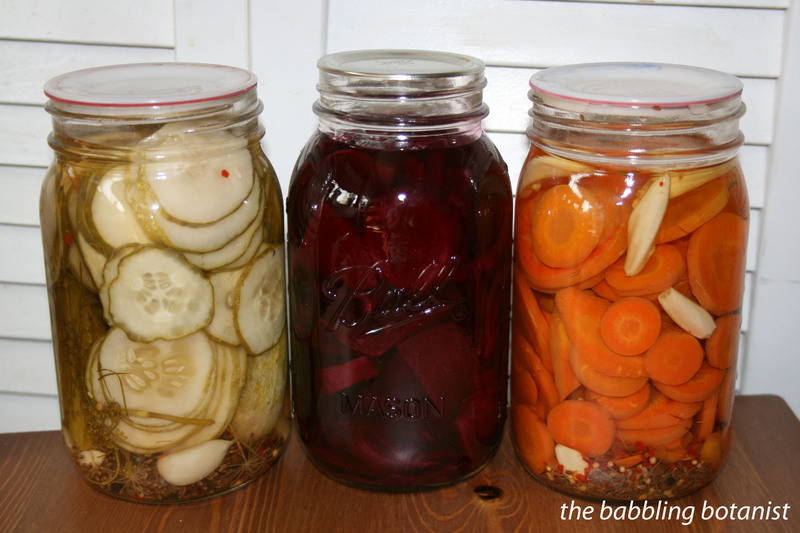 It actually doesn’t do much for your quick pickles, but may be somewhat useful in fermented pickles. So skip the alum and try #4 instead if you want. 8. Pickling lime. The calcium in lime will help firm pickles. However, lime also lowers the acidity, so you have to soak cucumber in water multiple times following the soaking in lime to remove the excess lime for safety. It does really work, but to me it’s too much work. 7. Soak cucumbers in ice water. This helps firm the veggies as well, I could postulate on why but couldn’t find a good source for why it works. Perhaps it hydrates them, and the cooling keeps them firm somehow too. Ahem, because science. 6. Grape Leaves. Some people swear by using a grape leaf in each jar of pickles for keeping them firm, but apparently a grape leaf’s tannins keep the cucumbers firm by counteracting the enzymes found in the blossom end (see number 5). Thus, if you removed that the grape leaf may not add any more. But maybe you missed a blossom end, who knows. 5. Remove the blossom end. When your cucumber is growing, the bottom end of it is called the blossom end (where the flower was). Trim this end off of your cucumbers, as it contains enzymes that soften pickles. Just a little sliver off the end takes care of those enzymes. 4. Pickle crisp – Pickle crisp is a Ball product, but I’m sure others make it too, as it is simply calcium chloride. Pickle Crisp helps keep pickles firm because the calcium helps firm the pectin in the cucumber, the same way lime does. 3. Don’t pickle over-mature cucumbers – start with a good quality veggie. Yes, sometimes the garden gets away from us and there are suddenly some big ole cucs on the vine and we are tempted to pickle them anyways. Don’t bother, unless you like mush. Big cucumbers may be hollow, or just be softer in the middle where the seeds are growing. Chop those up for your salad. Yes, I realize what I said in #10, but it works in this direction. 2. Pickle immediately. If you have your own garden this is easier, but do your best to pickle cucumbers as soon after picking them as you can. If buying them, ask the farmer when they were picked, or at least process them as soon after buying them as you can. Cucumbers will lose their firmness the longer you wait. Within 24 hours is ideal. 1. Low temperature pasteurization. To me this is the number 1 way to keep pickles firm, and often one overlooked because a lot of people don’t know it’s a thing. It might not be more important than using a good quality cuc to start with, but I put it first because so many people don’t know about it. Basically, overprocessing pickles can cause them to become soft. With low temp processing, you can process the recipes from this publication PNW 355 at 180-185 F instead of a full rolling boil. It works, it really works. For more on that see my experiment from last year – here. Are those white lids the reusable plastic ones I’ve heard of? If so, how do you like them? Yes, it really works. 🙂 And when I did the experiment comparing it to water bath canning, you could visually even see that the boiled ones looked mushier even that first day. It’s made a huge difference for me. Another thing I could have said is pickling whole rather than sliced, but I actually don’t do that. Keeps em a bit crisper though. Yes those are the reusable ones. They are ok, but I don’t love everything about them. I do feel as though I’ve had slightly more failed seals with them, and you are supposed to retighten them after they come out of the canner, which is annoying since the jars are hot. They also stain – like my zuch relish with turmeric in it stained badly. But I love the reusable concept, and they seem to work. I’ve only probably used them each 2-3 times so far but they are holding up ok. I never process my dill pickles in boiling water. Nor do i do carrots.